Roll up, roll up, welcome to the circus! Inside you’ll find a man whose legs have been eaten clean off, key and door systems based on chess pieces, and a mutant gator the size of a truck that chases you through the sewers. Fancy playing hide-and-seek with a child abductor and serial killer? Come right in! 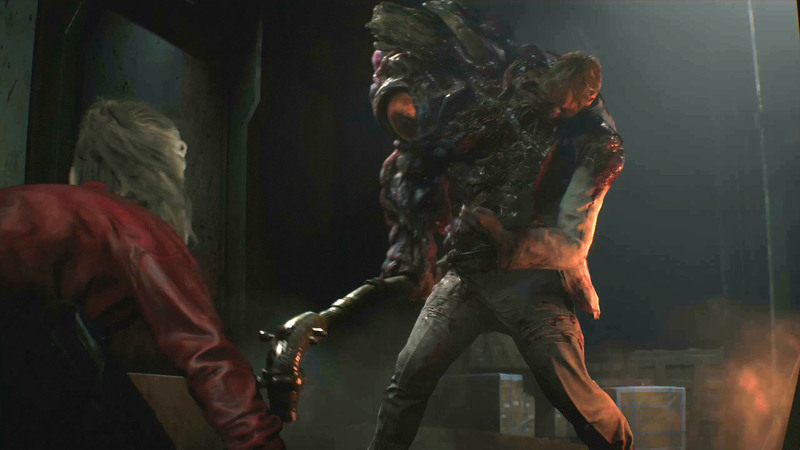 It’s not hard to make Resident Evil 2 sound absolutely ridiculous. This is a game that encourages you to shove a grenade into a zombie’s mouth and watch as its head explodes, sending wet gore flying through the air. Going back through each location is a chance to admire your handiwork: galleries of splatter, blood and brains decorating the walls, burst bodies turned into Pollock paintings. Try not to clap and cheer when cruelly dunking a zombie head-first into its own slippery insides – it’s sick and I love it. 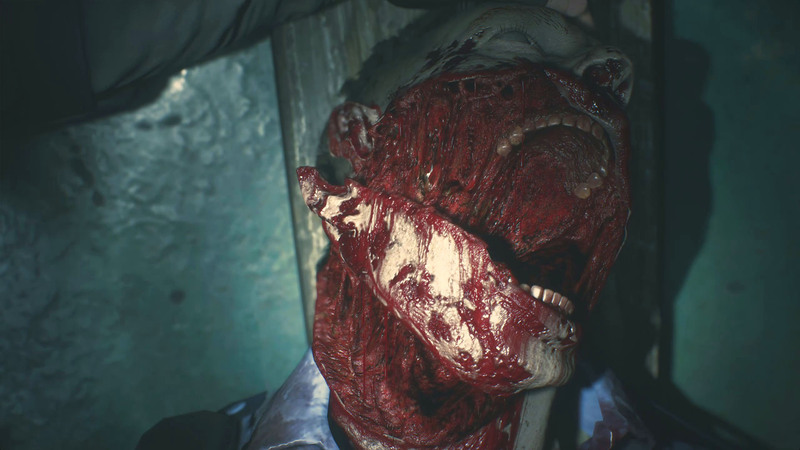 Capcom has turned maiming zombies into an artform. Shoot a cheek and it will pop with sticky viscera like an overgrown zit. Hands and forearms can be obliterated with a single bullet, or you can create zombie dominoes with a gunshot to the knee. As the undead rarely stay down for good it’s in your best interests to preserve ammo, but like a kid at a waterpark, it’s hard to resist splashing around in all the gunk. All the squishy heads and gut slush are made even better by the introduction of over-the-shoulder shooting to this remake. 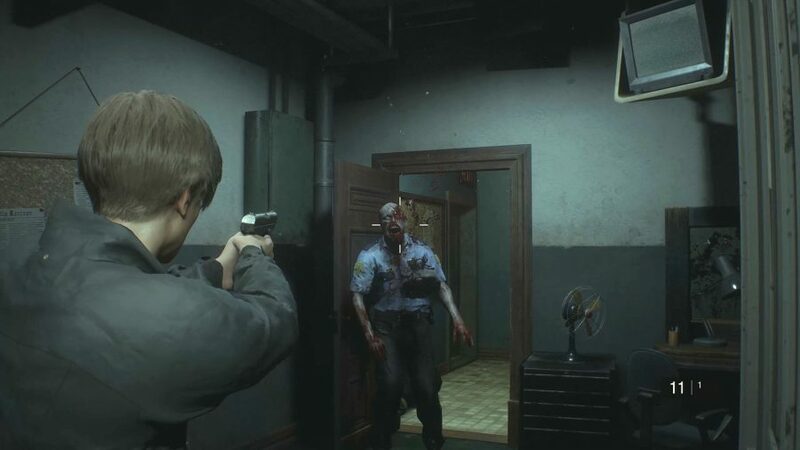 It strikes a careful balance, capturing the essence, if not the awkwardness, of the tank controls that induced panic in the original Resident Evil 2 – replacing them with a limited view and many ‘It’s behind you’ moments. It helps that the ease of aiming in the first-person Resident Evil 7 is carried over with this perspective, too. Not only does this new level of accuracy allow for playfulness in your excessive mutilation, it means Capcom can step up the difficulty later in the game by giving monsters weak points you have to shoot to take down – recalling Resident Evil 4’s terrifying Iron Maidens. Most of the flashbacks are to the original Resident Evil 2, of course. The story of Raccoon City’s sudden demise remains the same. 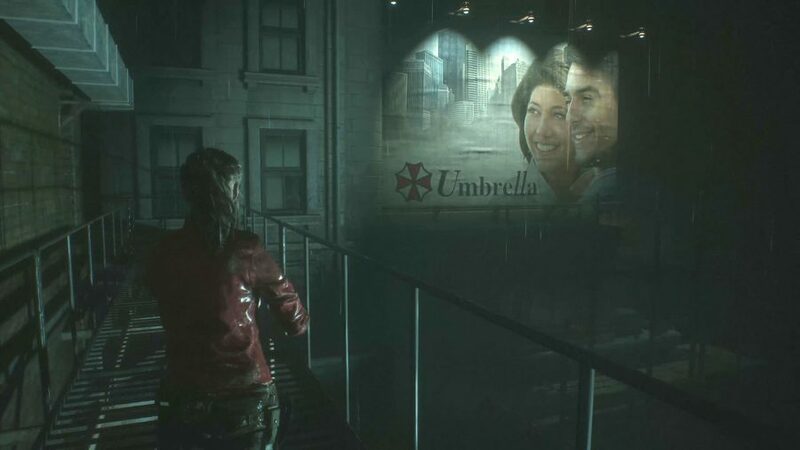 Umbrella, the pharmaceutical corporation that promises utopia, sold its lies on billboards while underground it developed flesh-mutating viruses to sell to the military. The game starts as the germ gets out, quickly spread by rats, plaguing the network of alleyways and interchanges that run like veins through the city. 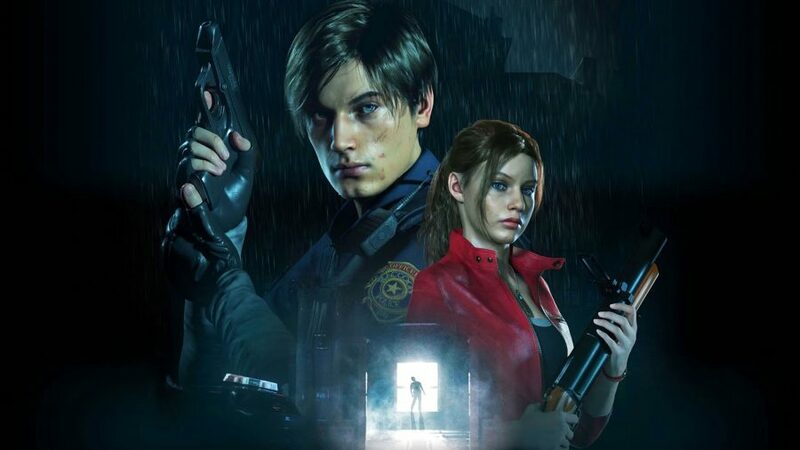 By the time the two protagonists arrive – rookie cop Leon Kennedy and hardened biker Claire Redfield – the urban body is writhing with a population turned cannibal. The two are soon split up, running through their own survival stories, and meeting multiple bogeymen along the way. They each partner up with a companion you get to play as briefly – Ada Wong for Leon, and Sherry Birkin for Claire. These small sections are among the tightest in the entire game, with chase sequences more thrilling than anywhere else, and their respective side stories add more layers to the plot. Back on the main campaign, all the big and important scenes make the cut – the window-smashing jump scares and multi-part puzzles – but they’ve been tweaked and given extra flourishes so as to subvert expectations. Think you know where the first Licker will turn up? Guess again. It’s a remix of the game that’ll catch out veterans, giving them the same feeling as when they first experienced Resident Evil 2, without compromising the horror of the original. The ‘gotcha’ moments almost make the past 21 years of wavering quality in the series worth it. Almost. Even better is that those same moments can catch you out twice. 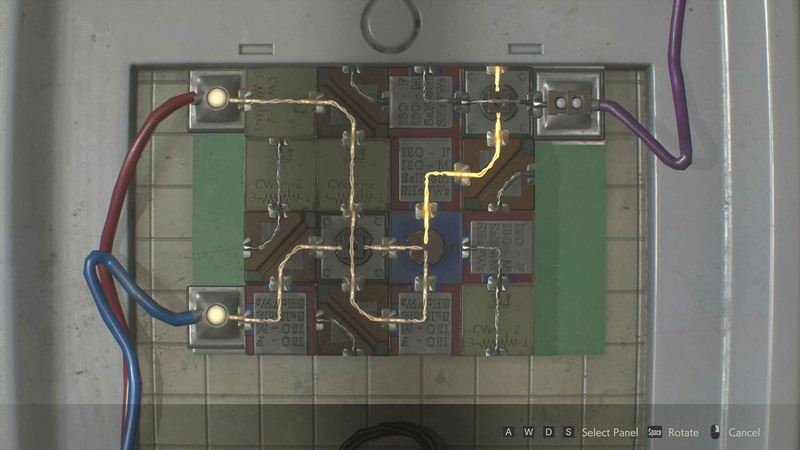 Complete the game once and you’ll unlock the 2nd Run mode. 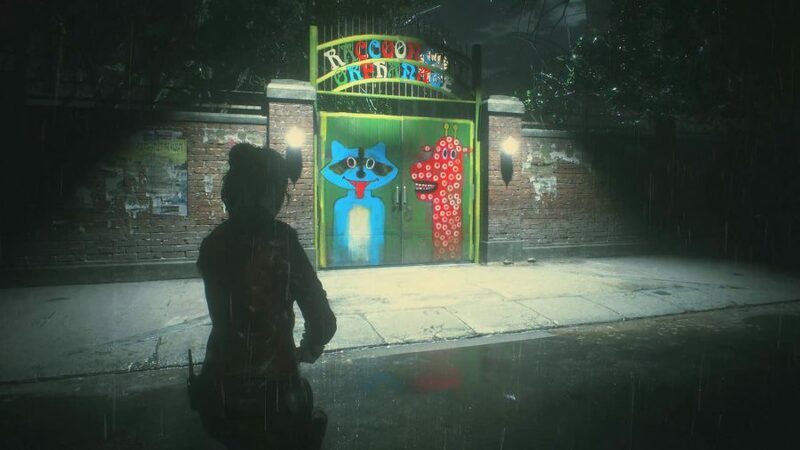 It’s designed to reduce repetition when replaying the game as the second protagonist, literally putting you on the other side of the wire fence that divides them, so that you can visit new locations like the Raccoon City Orphanage and meet different characters. But what impresses me most in my second run are the smaller changes. When opening up drawers containing corpses in a morgue on the first run, I – and this is a small spoiler – expect one to come to life and attack. It doesn’t. Instead, it lashes out in the second run, toying with the confidence that comes from completing the game once already. It keeps me on my toes. Capcom’s understanding of player psychology and how to exploit it to maximise scares is masterful. But the seasoned horror game studio also knows when to leave something untouched. The unstoppable Mr. X – a tyrant in a trench coat that you can’t kill, only slow down – is practically unchanged except you can now hear him stomping around any room adjacent to the one you’re hiding in. His stalwart pursuit of me around Raccoon City Police Station causes me to loudly yelp in fear while playing through the game. That whole section, in which you try to find medallions scattered around the art-gallery-turned-offices, is a brilliant piece of survival horror design that remains haunting even on multiple replays. 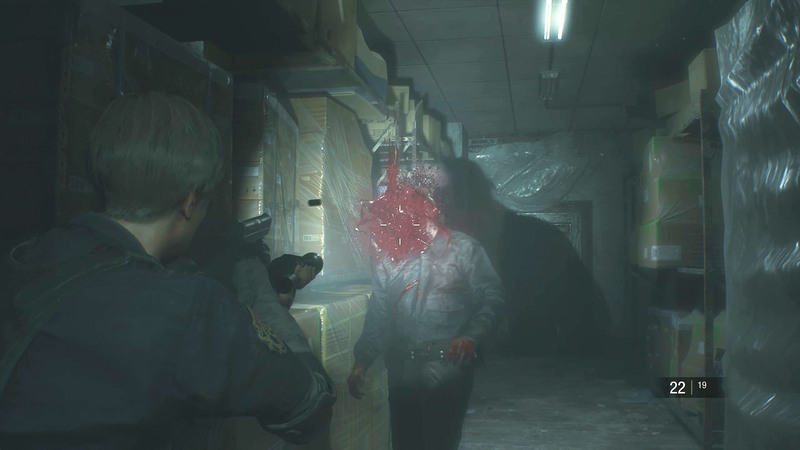 While Mr. X is definitely Resident Evil 2 at its most frightening, he’s not the game at its most horrifying – that belongs to any moment a zombie shouts “You!” as you run past. It’s not that you’ve been spotted, nor that the word is grated and raspy by the time it reaches your ear, barked through a throat that’s been shredded to ribbons. Instead, that word stands out – in a soundtrack that stops my heart so frequently it’s probably a health risk – because it’s human. It’s those sharp glimpses into recently extinguished lives that I remember the most when I think about the Resident Evil 2 remake. You can see it in the anguished face of William Birkin as he saves his daughter Sherry from certain death in an elevator. 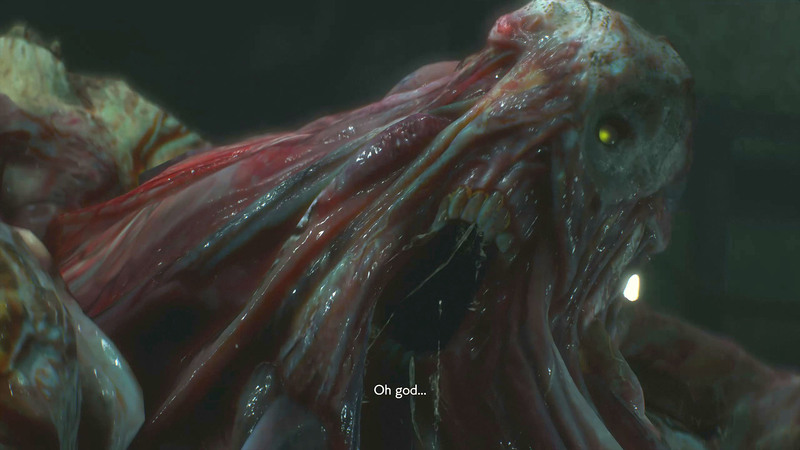 At that point the G-Virus has made the scientist’s flesh hot and bulbous, sprouting a giant eyeball in his shoulder, and an extra head among the red tumours crowding his neck. He’s a monster in every way, but for a second there’s a flash of the father trapped inside, fighting his way out of the beast. 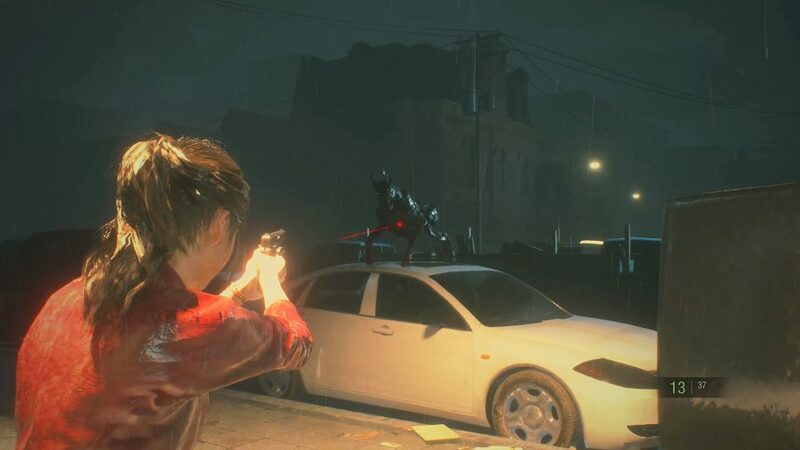 The cops in Resident Evil 2 weren’t ready for the zombie outbreak as it chewed its way across Raccoon City. Most of them end up either dead, turned into zeds themselves, or heavily wounded. We spoke to a real-life police officer and paramedic to find out how realistic the game’s portrayal of containment tactics during such a disaster is. The story of the Birkin family is one of the most tragic in Resident Evil, and its portrayal in this remake is a high point for the series. The mother, Annette Birkin, is particularly complex, my impression of her deepening across the two character campaigns as we see different sides of her life. On Leon’s side of the story, Annette is a cold-hearted scientist trying to protect her life’s work, still studying its effects even after it’s corrupted her husband beyond recognition and brought the apocalypse to an entire city. 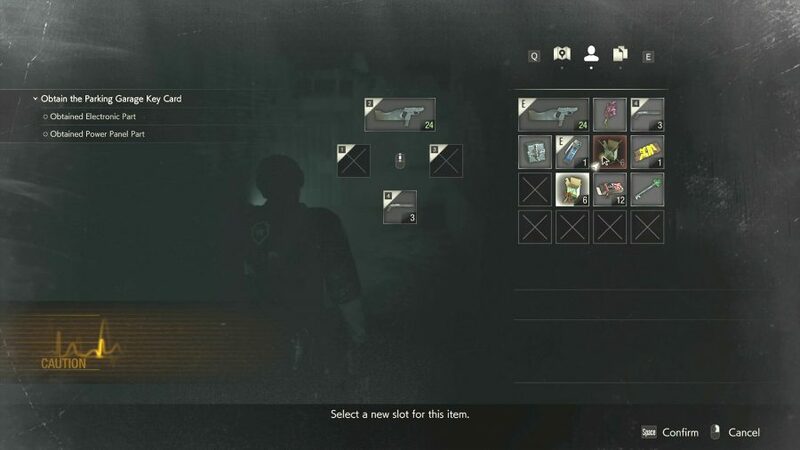 Playing as Claire, Annette comes across as a neglectful mother, dismissive of Sherry’s fate while knowing full well that of all the survivors left in Raccoon City, her daughter is at the most risk. What a despicable woman! And yet, somehow, the bit of regret she displays at the end of the game has me, if only a little, feeling sorry for her. Annette isn’t the only person to get this treatment. The brief encounter with the man who owns the Kendo Gun Shop is no longer a lesson in underestimating the undead, but a sad tale of a father who couldn’t protect his daughter – as exposed by her glassy expression and shuffling feet. 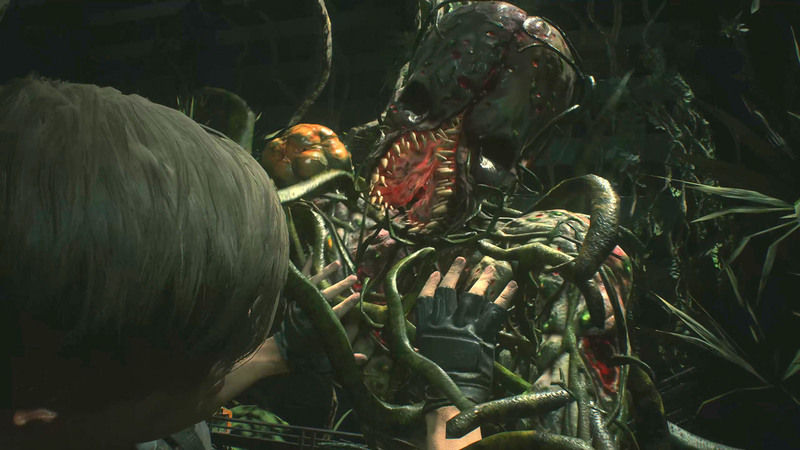 Other characters and story beats that were sideshows in the 1998 game have also been reworked to bolster the remake’s strongest theme: the horror of failing those we guard. It’s at its best in Claire’s campaign, as she does a better job of mothering Sherry than Annette, helping the frightened girl battle against the gruesome lust of police chief and orphanage director Brian Irons. He’s easily the most rancid creature in the whole game: he abuses his position to get close to weak children and do the unthinkable to them. Being pursued by a cast of monstrous men brings Claire and Sherry close together and imbues their side of the narrative with humanity. You feel the desperation and fondness they share, and that takes the emotional stakes of the drama to its highest point. Leon, on the other hand, is a sap. It’s a shame as he’s become the face of Resident Evil 2 and was made the solo star of Resident Evil 4. That curtain parting is the only part of him that leaves an impression. He struggles to find a single genuine emotion and his attempts at comedy only expose his shallow character development. “Hope I don’t have to write a report on this,” he says after bringing a bell crashing down from a clocktower. First of all, you have bigger problems Leon, and second, that’s not even remotely funny. The only real pleasure I get out of being around Leon is listening to the moans he makes when running around wounded – then I know he’s hurting as much as I am when I hear his jokes. 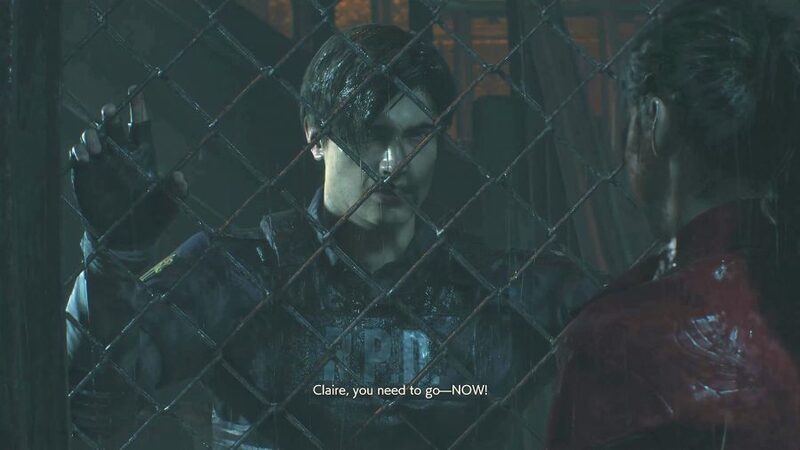 It feels like Capcom has tried to make Leon’s campaign more lighthearted to balance out the heaviness of Claire’s, but doesn’t commit enough to the effort. 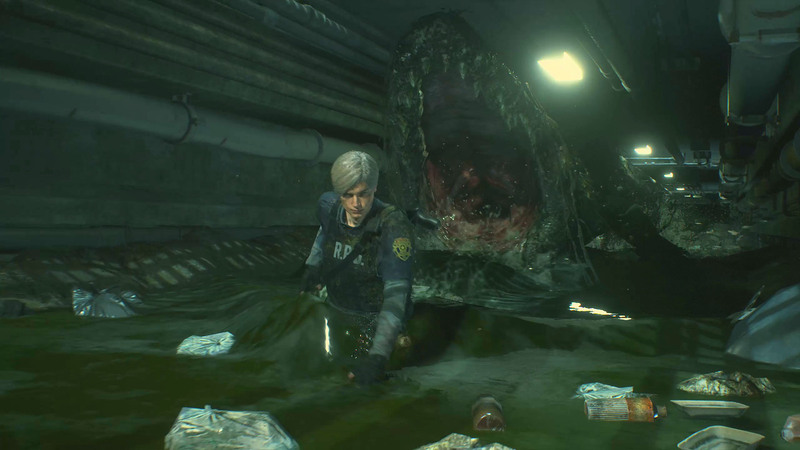 A big part of the appeal of the Resident Evil series is its goofiness, and while it’s not entirely absent in this remake, it does feel lacking. Yes, the lavish streams of gore are a superb, modern take on the campy horror that has defined the series; there’s a great visual gag early on when you find a freezer advertising Herb Ice Cream; and you can still unlock Tofu – literally a giant piece of sentient tofu – as a playable character. But the attempt to make sure every part of Resident Evil 2 has a logical explanation behind it, no matter how silly, has caused the game to lose some of its outlandish personality. Not that I’m thinking about that when aiming a shotgun at a zombie’s head at point-blank range so that the blood squirts into my character’s face and all over their clothes. 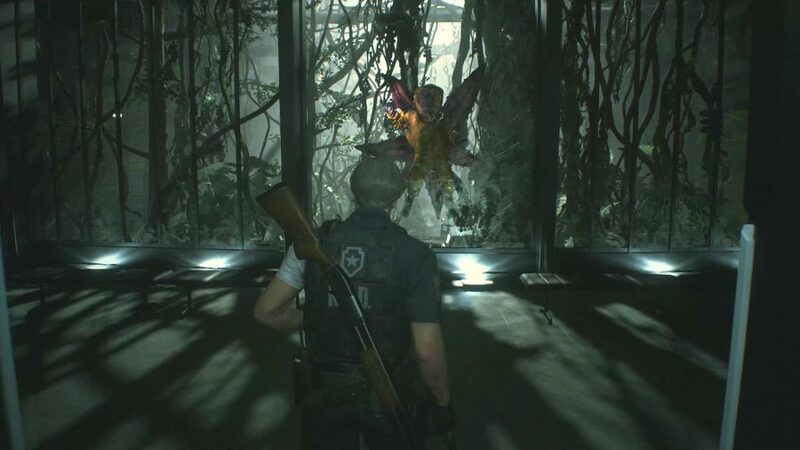 This remake is a bloodbath for longtime fans to relish, but one that stands tall among the survival horror greats of today. It would do so even without the legacy behind it.